Tomorrow sees the launch of an exciting new exhibition at The Imperial War Museum in London. Fashion on the Ration explores the issues faced by both men and women during the period of clothes rationing which took place during the Second World War and for a while after. I popped along to the press view of the exhibition this morning and if you’re planning on going you really are in for a treat. I’ll be covering the exhibition more in a post later this week. Today I’d like to share my thoughts on the incredible book which accompanies the exhibition. The book is written by Julie Summers who writes fascinating social history books focussing on the war years. I’ve read another of her books and absolutely loved it so I was really looking forward to leafing through the pages of this one. 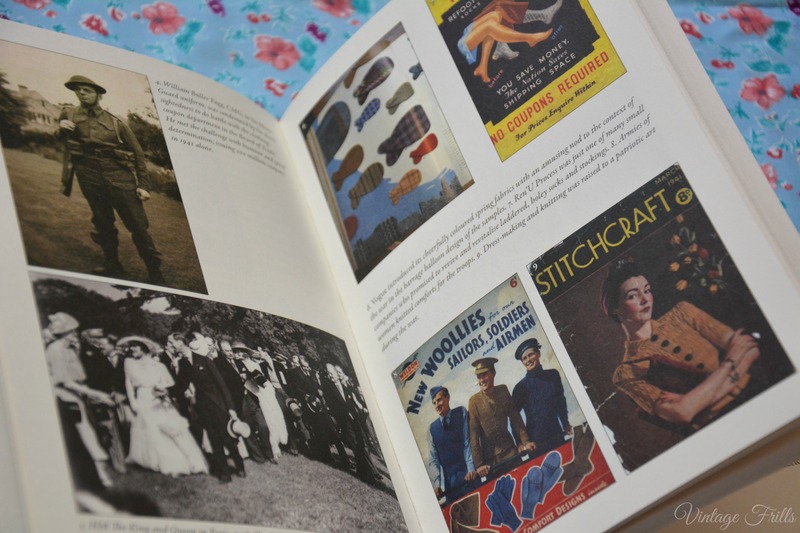 The hardback book not only features nearly 200 pages of text but is full of wonderful images, be they photographs of clothing, government posters or magazine adverts, they really add an extra insight into the issues faced during the war years. As well as the glossy colour photos on the middle pages, there are other images scattered throughout which add a little extra context to the accounts covered in the book. One thing I really love about Julie’s writing is how she brings real people into her books and talks about their lives and experiences, she is a fantastic story-teller as well as historian and this makes her books real page turners. As well as the fantastic writing, the actual subject matter is absolutely fascinating and paints a picture of life in war-time in a light I’ve not experienced before and I feel like I’ve gained so much knowledge not just on the fashion of the era but also on the day-to-day lives of women and their struggles at a very difficult time. 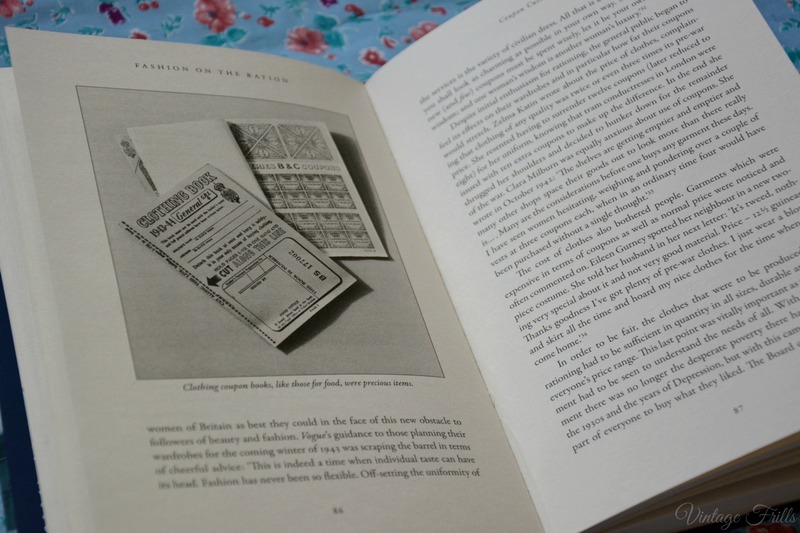 Subjects covered include women’s uniforms during war-time, the introduction of rationing and how it worked as well as utility clothing and fashion directly after the war, she also covers subjects like beauty and make-up during war-time and how fashion magazines coped with the difficulties of rationing. The book goes into great detail talking about why rationing was needed, how many coupons people received and what they could get with them. 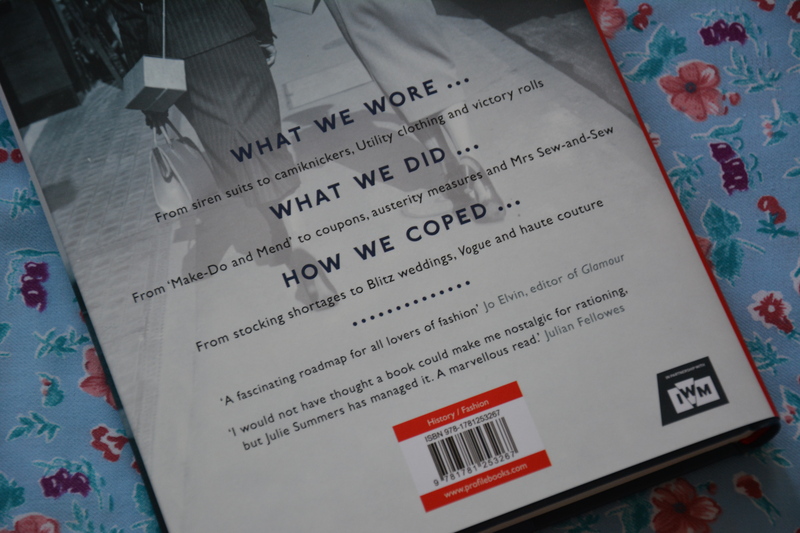 For me as a vintage fashion enthusiast I found the chapter about CC41 utility clothing and the top end designers brought in to design them especially interesting. I also felt truly inspired by all the description of how women took on the responsibility of ‘make do and mend’ and how creative they were when it came to making clothes last and making clothes with the materials available. There is so much we can take from this today. The author uses a fantastic mix of references throughout the book including diaries and letters written at the time as well as women’s magazines especially Vogue, she also looks a lot at the information that the government provided for the people, which gives a very well-rounded account. I’m really glad I got the chance to read the book before visiting the exhibition as I felt I gave all the items on display a greater relevance and poignancy. I also recognised some of the items mentioned in the book such as a suit that was worn to a wedding and a set of lingerie made using RAF silk maps. I’d recommend the book to anyone who has an interest in fashion both vintage and otherwise as well as history enthusiasts. If you’re a home sewer you’ll also find the book really inspiring. I loved the book because I felt I gained a real snapshot of an era and the social history of war-time Britain. I have a new-found respect for the generation of women who managed to juggle so much and I’d really recommend giving it a read. 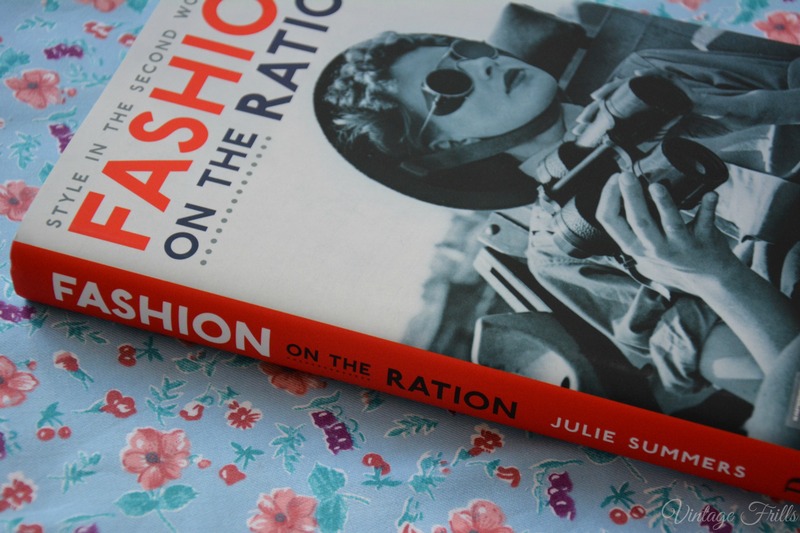 You can buy a copy of Fashion on the Ration on Amazon. 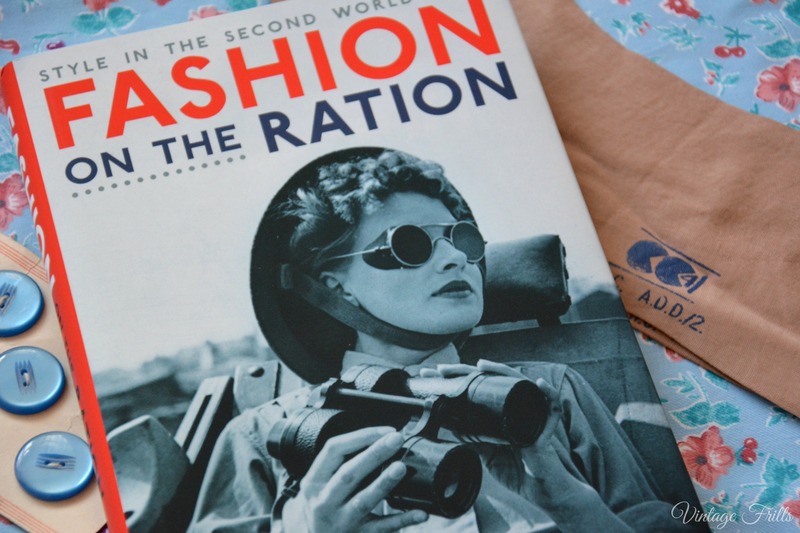 Fashion on the Ration is published by Profile Books and Accompanies the exhibition at The Imperial War Museum. I will announce the winner once the giveaway has ended and will contact the winner to arrange delivery. This giveaway is only open to UK based readers. Sounds like a really interesting book to learn a lot from! Wonderful you got to go to the press opening. I can’t wait to check the exhibition out myself. Going to take a few friends so should be fun. I’m a big fan of buying books when I go to a good exhibition as its a great record of what you saw so think this will be on the list as it looks fab! Can’t wait to see the rest of what you got up too. Looks like this book is right up my alley and would make a WONDERFUL resource for my fictional vintage novels and short stories! I hope I win! Love you site. I’m even excited about the ads. Those are a great source for me as well. Gorgeous site all the way around. Ever since I caught wind of this stellar exhibition, which I’d pretty much swim the Atlantic to see in person, if such were feasible (alas, it’s not, darn! ), I’ve been dying to attend. I know that won’t happen, but thankfully this book is the next best thing and I will be keeping my fingers, toes, and saddle shoe laces firmly crossed that lady luck is on my side. Thank you very much for holding this wonderfully lovely giveaway! My husband did his dissertation related to women, fashion and the war so I think we would both find it an interesting read. I just love the history of fashion during WWII, and would be so fascinated to read this. Even if I don’t win, I look forward to attending the associated exhibit at the museum and getting a copy of the book then! I love studying the fashion history, so it would be a great book to extend my knowledge of vintage fashion! I so love to win a copy of the book, I’ve already booked my ticket to see this with my fellow Sewing Bees in May. I love collecting vintage sewing bits and buttons, it would be lovely to see if anything I have is from then too.